Most of your players, if not all, prefer playing the game over the alternative—drills and instruction. It’s a rare practice where I don’t hear one of my young players ask, “Are we going to scrimmage tonight?” Even if we always scrimmage, the question is asked by players to try and get more scrimmage time! Since kids enjoy scrimmaging, let's consider how you can use this activity to not only satisfy their desire for fun and competition, but also teach principles, skills, and teamwork. Coaches tend to view the benefits of practices scrimmages differently. Some coaches believe that scripted drills and instruction are the most effective use of practice time. These coaches may think that scrimmaging is worthwhile, but only when his or her team is “ready” to scrimmage (i.e., the players have a good understanding of skill fundamentals and their team’s offensive and defensive schemes). These coaches see little benefit in the confusion that typically arises when a group of novice players scrimmage. Other coaches, however, believe that scrimmages are an important teaching tool—even when the coach’s players are not yet ready to execute his or her strategy and the play is filled with mistakes. They view practice scrimmages as a means to help develop each player’s fundamental skills and capacity to quickly (and correctly) react to game situations. Before we take a closer look at the benefits of scrimmaging, understand that scrimmages can either be controlled or uncontrolled. The latter is typically where a coach throws the ball out on the floor and simply lets the players play. In this type of scrimmage, the coach is not actively engaged. Uncontrolled scrimmages may be useful to let players enjoy some self-directed, competitive fun. In controlled scrimmages, the coach sets the conditions of the competition and provides feedback to his or her players during the play. A coach may bark out instructions as opportunities present themselves, encourage players when correct decisions and plays are made, and sometimes yell at players who fail to make a proper play ("John! Alex was open under the hoop for an easy basket. Keep your head up when you're dribbling!"). When a serious mistake occurs, the coach may choose to stop play and provide more detailed instruction. Controlled scrimmages are usually the best approach for both learning and having fun, so let’s focus on the benefits of this form of scrimmaging. First and foremost, scrimmages provide a setting that helps enable your players to connect a skill with a situational game opportunity. For instance, a basketball low post player may understand how to perform a drop-step move to score a basket, but does he or she recognize the moment when the opportunity presents itself? Is he aware that his defender is positioned such that he can seal off the defender with his body? Does he recognize that his point guard is positioned (or will soon be positioned) at the correct angle to make an entry pass? And if defended a certain way, can he or she quickly identify the available options to regain positional advantage? Recognizing these game situations, and instinctively applying an appropriate skill, are most often learned by playing the game. Yes, certain competitive drills can simulate a game situation, and may be a steppingstone to learning how to perform and apply a skill. Combined with instruction, these drills may be the necessary first step in this learning process. But most sports are a real-time, interactive experience that often requires split-second decisions and reactions. The constant flow of movement, the opening and closing of space, the fleeting moments that provide opportunities to gain advantage, are best understood when players participate in the game activity itself. And in an age where neighborhood “pickup” games are much diminished, scrimmages in organized sports programs play an essential role in exposing players to game situations—ones that provide an opportunity for the players to learn which of their “moves” work, and how and when to use them. Secondly, as touched on above, controlled scrimmages provide the team’s coach with one teaching moment after the next. As the scrimmage’s game situations change, the coach can shout out instructions to his or her players, helping them to understand and recognize opportunities to succeed, and any mistakes made. This type of engagement by the coach provides instant feedback to his or her players, and helps tie a game situation to an appropriate response. Where a serious error is made, or an opportunity missed, the coach can stop play altogether and instruct the player(s) on how they should have reacted or performed. The instruction that arises out of a controlled scrimmage can be especially helpful to beginners. Another important aspect of a controlled scrimmage is that the coach sets the conditions within which the play takes place. A coach can change the conditions as needed to help teach certain behaviors. Each sport is different, but you can usually modify either the number of players on each team or the rules to emphasize a certain skill or principle. By reducing the number of players on each team, you can change the game’s dynamics (i.e., more space, more one-on-one opportunities, more ball touches) and also stress certain skills. Modifying the rules accomplishes a similar result, and also gives you the opportunity to change behaviors and tendencies that are unproductive. Players are only allowed to dribble (one time) when converting a layup. At all other times, the player who receives a pass must advance the ball down the court by making another pass. Players typically struggle with this rule at first, continuing to immediately dribble the ball upon receiving a pass. But after blowing my whistle a few times, they begin to make the proper plays. What does this one rule change accomplish? Players who have the ball quickly realize that they need to keep their head up and have an idea where their teammates are located on the court. They find that upon making a pass they must move to get open (“move without the ball”) to again receive the ball. They learn that they cannot run away from the ball, but must instead go toward it when no other teammate is open. They realize the importance of being in control of their body when receiving a pass. 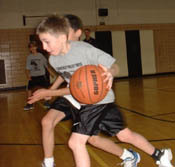 They become aware that passing can move the ball down the court faster than dribbling. They learn how to play as a team. Try to see beyond a practice comprised only of drills and instruction. Allocate time for scrimmaging in each practice. Even though your players are beginners, and your practice scrimmages full of confusion, use these scrimmages to better develop your players’ understanding of game situations and provide them with a measure of competitive fun. Engage your players while scrimmaging, taking advantage of teaching moments as they arise. Use your imagination to modify the scrimmage’s rules to fit your teaching purposes (and refer to coaching books specific to your sport for additional ideas). You will find that your players enjoy these slightly twisted rules and modified scrimmages. Jeff, thanks for this! Scrimmaging is a great method to get in game experience.